Don't clean and stow your shotgun yet. A BLANKET OF SNOW covers Utah mountains and valleys and frigid temperatures are icing lakes and reservoirs. It’s the time of year when several of our hunts are over or winding to a close. Guess I should clean my shotgun and put it away until turkey season opens next spring. When snow and cold temperatures grip Utah, many upland game hunters turn to indoor activities. However, if you choose the warm fireplace route, you’ll miss some of the exciting upland game seasons that remain open well into the new calendar year. Chukar and Hungarian partridge seasons are open until mid-February, cottontail rabbit season is open until the end of February and snowshoe hare season continues until mid-March. Rabbit and hare populations in Utah are cyclic. That is, every 7–10 years, these populations reach fairly predictable highs and lows. Snowshoe hare populations peaked in 2005, declined through 2008, and are now increasing. The snowshoe hare is one of three mammals classed as upland game in Utah, but it is hunted by only two percent of upland game hunters. In 2011, there were 634 hunters who pursued snowshoe hares in Utah. They harvested 1,682 hares. Despite somewhat low hunter interest, snowshoe hare hunting offers the adventurous upland game sportsman a very unique opportunity. You’ll find snowshoe hares in Utah’s pine and spruce forests, especially in areas with interspersed thickets of aspen, alder and willow. These forest-dwelling hares prefer mountainous areas above 7,000 feet. Because of where snowshoe hares live, you might literally have an entire mountain to yourself! Snowshoe hares eat a variety of green, succulent plants in the spring and summer. In the fall and winter, their diet turns to bark; twigs of alder, aspen and willow; and other trees and shrubs. They also prefer shoots of young evergreens. Snowshoe hares average 2.5 to 3.5 pounds as adults. They are slightly larger than cottontail rabbits but smaller than jackrabbits. From late spring through early fall, the snowshoe’s fur is gray-brown. In late fall and early winter, this fur changes to pure white, except the ear tips and eyes which remain black. Besides its changing coat, you can identify this hare by the enormous hind feet from which it gets its name. The hind feet are vastly out of proportion compared to the front feet and are nature’s way of helping the hare survive. The large hind feet ride upon loose snow much like snowshoes. 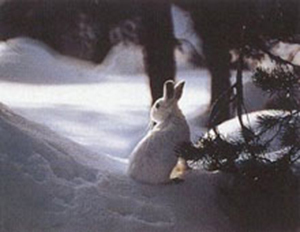 They allow the hare to outrun potential predators such as bobcats and coyotes that sink in deep snow. If you head to the mountains for snowshoe hare, be sure to take a pair of snowshoes or cross-country skis; it’ll make getting around in the snow much easier. 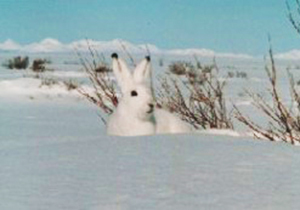 Most of the time, snowshoe hares rely on their camouflage color for protection. They blend in with snow very well and are hard to see if not moving. A cautious hunter maneuvering slowly through hare habitat should look for brief movement in the understory. The black ear tips and eyes of the snowshoe often give them away. Hunters should look for snowshoes loafing in brush piles and at the base of fir and pine trees during the day. You can flush hares into the open and then take them with a shotgun, .22 caliber rifle or archery equipment as they dash for cover. If a snowshoe thinks you have not spotted him, he will sit in the protective cover at the base of an evergreen tree for hours and let you walk past! The Wasatch Plateau of the Manti-La Sal and Fishlake national forests. Snowshoe hare hunting can provide a quality day afield for the upland game hunter. It’s also a great way to teach a beginning hunter safe firearm-handling in an uncrowded, low-pressure environment. Snowshoes make great table fare as well. Prepare them just as you would cottontail rabbit or chicken! I enjoy reading everything you put on your website! Thank you!! This will be my first year hunting Hares…I certainly look forward to such tips. Are hares and rabbits always safe to eat? Are there any diseases to watch out for? Can you use hounds . Will they run a circle pattern when chased like a cotton tail?